It always lifts my heart to see and hear these birds. Sapsuckers make tiny holes in the trunks of trees, which hummingbirds also drink from – they work together, and often I cannot tell them apart. How fast do their tiny hearts beat, I wonder? How does the hummingbird know where the sapsucker has gone before? What does nectar taste like through that needle-beak? I smile with the delight of seeing a creature who lives on the sweet blood of plants, who darts from sip to sip, and sometimes pauses to fix a tiny black seed of an eye on me for a moment. Their busy whirr tells me dawn is here. If I did not know their sound, I might never see them at all. Both of these birds bear the name wanga nègès, which translates roughly to something like “negress charm.” Though I can’t fully trace the etymology of the name, it is both offensive and evocative, its colonial denigration calling to my mind a trans-Atlantic system of knowledge and practice that stretches between West and Central Africa, Haiti, Martinique, and New Orleans. The name wanga, perhaps of Bantu origin, finds its origin in the West and Central African practice of endowing an object with power that it may serve as a means to manipulate human relationships. Scholars of Haitian vodou trace the wanga to the nkisi or minkisi object in West and Central African religious practice, which colonizers narrowly termed “fetish objects.” In his book Wizards and Scientists: Explorations in Afro-Cuban modernity and tradition (2002), Stephan Palmié explains the nkisi object as a means to “concretize conceptions about relations between human and cosmic spheres” (25). Often bound with string or metal chains, these objects — what Palmié calls “aggregates of heterogeneous materials” are thought both to “contain a spiritual presence and to render its power” (168). In the New World, the nkisi object became the wanga, which, especially in Haitian vodou, may still connote a bound ritual object, but also more generally a charm or spell. What is a charm, and why do these two sippers of nectar bear its name? The significance I take from Palmié’s definition is that the work of the charm happens neither in the object nor in some separate realm, but in the relations that bind the two together. The charm is a transformative agent, which I see paralleled in hummingbirds’ role as pollinators. The metaphor of pollination is likewise an apt description for the trans-Atlantic networks across which Caribbean decolonization was thought and experimented in the mid-20th century. Thinking about pollination helps me to understand decolonization as on ongoing transformative project, a sort of charm that establishes relations of liberation across time and place. 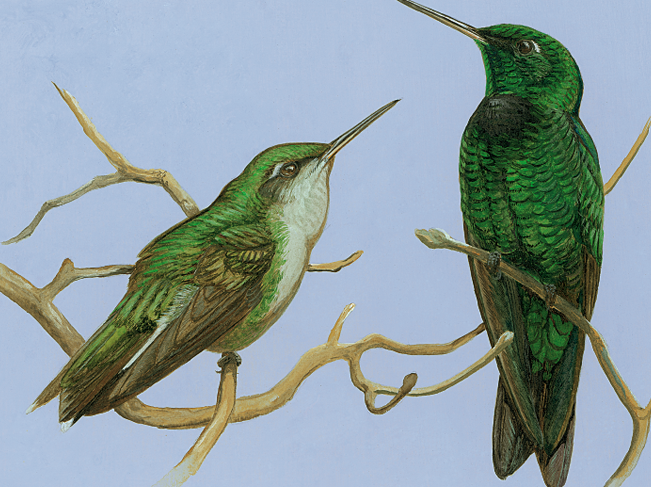 The hummingbird brings me back to 1942, when “Colibri,” a hummingbird character in Martinican folklore, appeared in an issue of Tropiques. In 1942, Martinican Aimé Césaire, the future mayor of Fort-de-France, was living and studying in France. In the 1930s, Black students from Africa and the Caribbean who were philosophers, poets, critics, and essayists met at and around the Lycée Louis le Grand and the Ecole Normale Supérieure in Paris. These thinkers were influenced by and participated in surrealism, which picked up a (neo)colonial tropical thread initiated in the last decades of the 19th century. 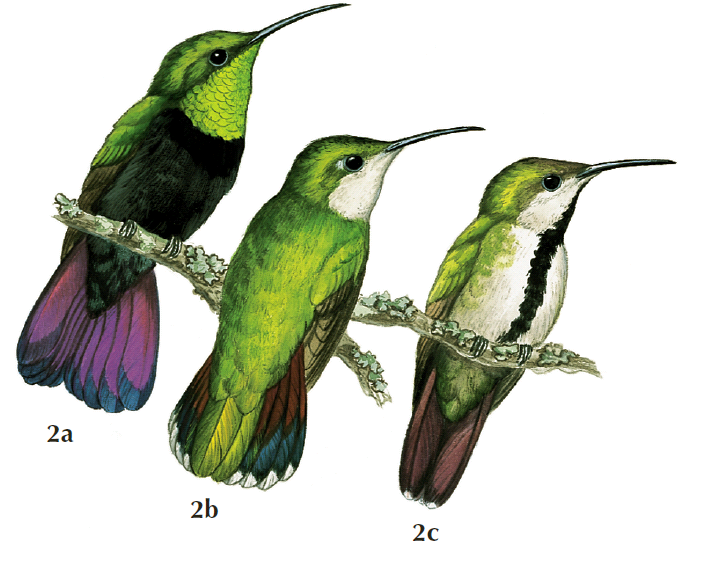 The “Conte Colibri” – ‘tale of the hummingbird’ – published in Tropiques was originally recorded by Harper’s writer and journalist Lafcadio Hearn (1850-1904), who spent two years in the Antilles from 1887 to 1889. As a correspondent, he was based in Martinique, which, in the mid-20th century, would become a nexus of anti-colonial thought. Césaire and his comrades generated Négritude – an intellectual movement rooted in pan-Africanist thought that valorized Black culture and cultural forms – in the colonial metropole of Paris. In the 1940s, however, the movement returned to the Antilles, when the war forced many students to cross the Atlantic again. Steeped in the French intellectual tradition, dedicated to the Communist party, and deeply inspired by their involvement in the development of Négritude and pan-Africanism, the group of young people who returned to Martinique from Paris worked to transform the Caribbean into a site of radical intellectual production, which often drew explicit inspiration from the Haitian Revolution, from which the world’s first Black republic was born. In the 1940s, Haiti had just emerged from a much more direct occupation than the dependency that still today defines Martinique and Guadeloupe as “overseas departments” of France. Haiti had won its independence from France nearly 150 years past, but the US military occupation of 19 years had only just ended. During the occupation period, an indigéniste arts movement called forth a swell of creative political resistance drawing from Haiti’s African roots. This movement had its militant analogue in the guerrilla Caco Rebellion of 1918, the sole significant armed challenge posed to the occupying force during those 19 years. Between the end of the occupation in 1934 and the beginning of the Duvalier dictatorship in 1957, Haiti had 10 heads of state, several serving for less than one year. Those two decades established a turbulent political pattern of oscillation between democratic process and military junta whose tensions and reverberations still disturb Haiti’s political fields. Despite the political turmoil of the mid-20th century, Haitian visual art and literature flourished from the 1940s onward. Though today a majority of Haitian writers publish (usually in French or English) from the diaspora, the country’s locus of Afro-centric cultural production remained in Haiti until the exodus of many intellectuals at the end of the Duvalier regime in 1986. All this is pollination, though sometimes — most often — the nectar is not sweet but bitter. From the Middle Passage to occupation, exile, and diaspora, radical Black Antillean culture has never been rooted solely in Caribbean soil. And yet I see more pollinators here on MPP’s campus than I have ever seen in a single garden. The hum of their wings reminds me that nectar is not always sweet, but that there is a deep well of history, of place, and of struggle that binds the cultural and natural ecosystems of the Atlantic world. Even conscientious scholars often understand Haiti as a place that never-was or must-not-be. The hummingbird is a charm that helps me locate Haiti at the center of a network without which the Americas themselves never would have been. Césaire, A., Ménil, R., & Leiner, J. (1978). Tropiques. Paris: Éditions Jean-Michel Place. Palmié, S. (2002). Wizards and scientists: explorations in Afro-Cuban modernity and tradition. Durham: Duke University Press.